Yamaguchi graduated in bamboo craft from the Beppu Occupational School in 1957 and, at 23, apprenticed to Living National Treasure Shono Shounsai. A decade later he began receiving accolades, garnering the Beppu City Mayor’s Award and Oita Prefecture Governor’s Awards. Between 1966 and 2004, he won more than 25 important prizes. His work has been purchased by the Oita Prefectural Art Hall, Oita City Museum of Art, and Mint Museum, Charlotte, NC and exhibited in Best Bamboo Baskets: the Cotsen Collection at Long House Reserve in East Hampton, NY. I listen to it. The bamboo says many things tome. I enjoy my conversations with it. the beauty of flowers, the beauty of moving clouds. I try to bring the beauty of nature into my sculpture. At the age of sixteen my father encouraged me to learn bamboo basketry. After learning the basics at the Beppu Occupational School, my first opportunity knocked at my door in 1963 when I became a live-in-assistant to local basket maker, Shono Shounsai. 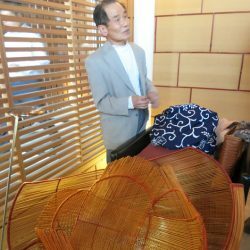 I worked at his Shikutei Studio for a year making Shounsai-designed bamboo trays. I spent as much time as possible after hours at my master’s studio watching and learning how he created his exhibition pieces. This became the foundation of my art making. After leaving his studio, I started to create my own art work submitting one or two pieces a year to juried public exhibitions, while earning a living making simple flower baskets ordered by bamboo wholesalers. The second opportunity knocked at my door when Mr. Robert Coffland visited me. He introduced my work to the West. To my great surprise the Western audience accepted my artwork, and I became a full-time artist. Mr. Coffland kindly offered me a solo show in Santa Fe, NM. I have participated in a number of group shows in Japan, but this was my very first solo show. I am very grateful. It is the third opportunity knocking at my door for the next chapter in my bamboo art.